SKU: 2106. Categories: Antique Prints, Northumberland. Tags: antique print, celtic christians, copper-plate engraving, farne islands, geneology, lindisfarne, monks, original print, picture framers, picture-framing, prints for sale, st cuthbert, vintage print, vintage-picture. 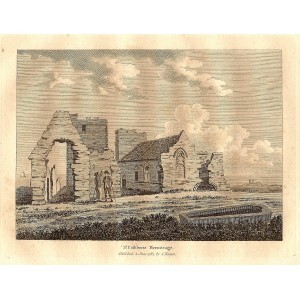 Antique copper-plate engraving of St Cuthberts Hermitage. 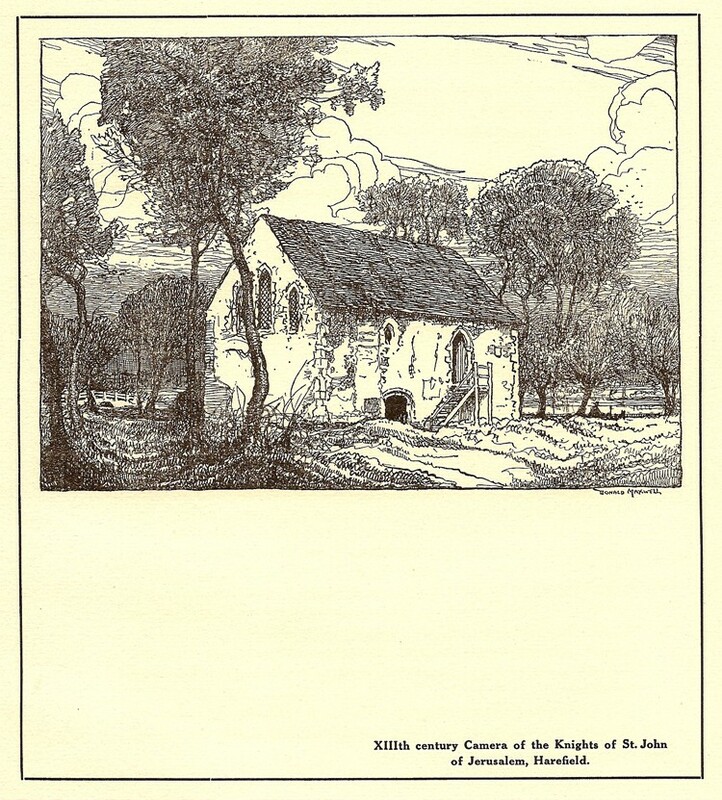 Dated in the plate 4 June 1783. Size of engraved area approx 5x6ins. Farne Islands. The earliest recorded inhabitants of the Farne Islands were various Culdees, some connected with Lindisfarne. This followed the old Celtic Christian tradition of island hermitages, found in England, Ireland and Scotland. The islands are first recorded in 651, when they became home to Saint Aidan, followed by Saint Cuthbert. Cuthbert isolated himself on the islands until he was called to the bishopric of Lindisfarne, but after two years he returned to the solitude of the Inner Farne and died there in 687, when Saint Aethelwold took up residence instead. Among other acts, Saint Cuthbert introduced special laws in 676 protecting the eider ducks, and other seabirds nesting on the islands; these are thought to be the earliest bird protection laws anywhere in the world. The islands were used by hermits intermittently from the 7th century. These included Saint Bartholomew of Farne who occupied St Cuthbert’s hermitage. The last hermit was Thomas De Melsonby, who died on the islands in 1246. 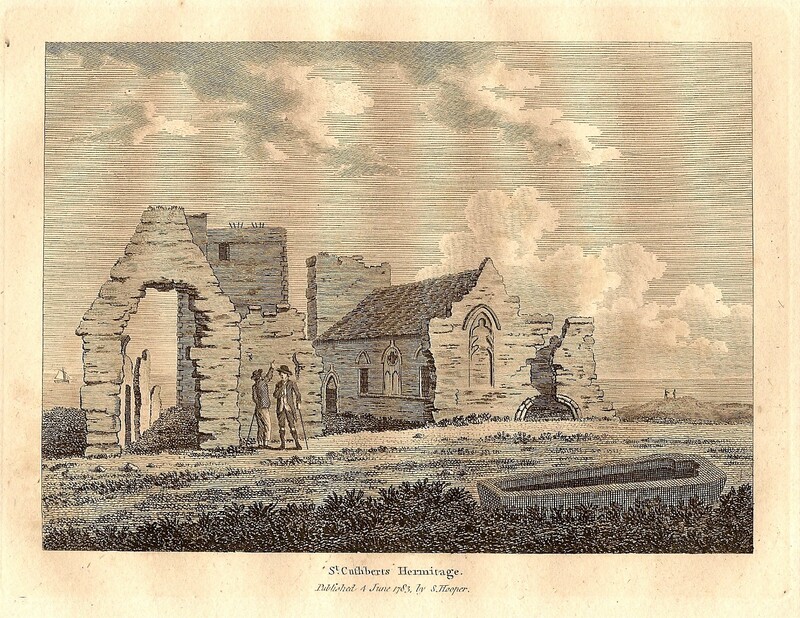 This copper-plate engraving is from: ‘The Antiquities of England and Wales’ by Francis Grose. Eight volumes published from 1772. Printed in London for Hooper and Wigstead. Artists and engravers names are recorded below each antique print, together with the date of the engravings execution. Francis Grose’s interest was in the field of medieval remains, which were beginning to exercise an increasing grip on the public imagination. In 1772, he published the first part of ‘The Antiquities of England and Wales,’ a work which he unashamedly aimed at the popular market. Essentially, it targeted those who wanted to know about antiquities but had neither time nor means to visit them in person, and contained small panoramas of medieval ruins, together with an informative text on a separate page. Sometimes the text was taken from books already published, or from information supplied by other antiquaries (both acknowledged); sometimes Grose collated material himself from which he could work up an article. 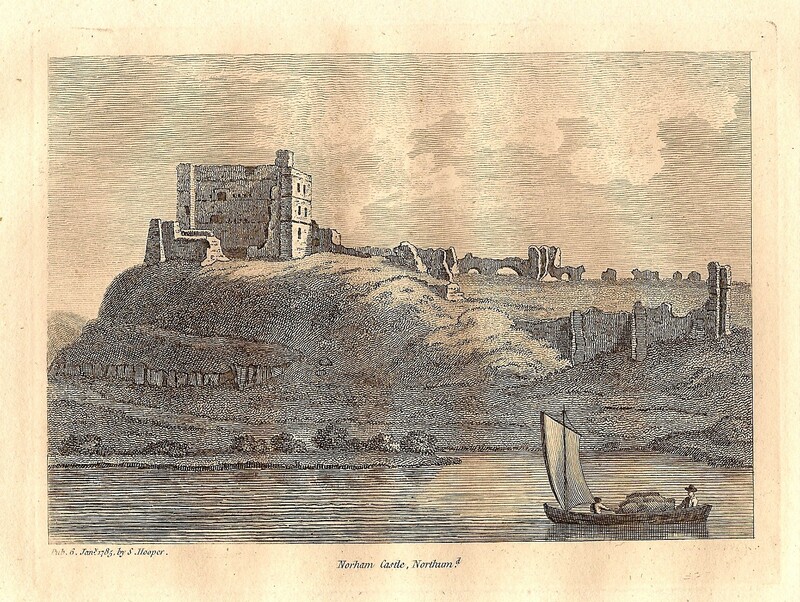 From 1772 onwards, he also toured the country to visit and draw sites for inclusion in The Antiquities. In all, Eight Volumes of the work were published. Thank you to Wikipedia for supplying links and some of the above text.